The Big Wobble: Wildfire rages in highly radioactive Fukushima mountain forest! 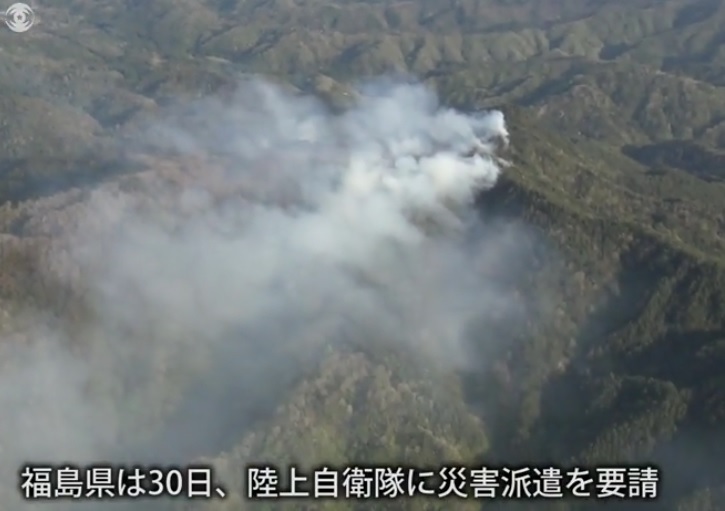 The area is designated as a "difficult-to-return zone"
Wildfire rages in highly radioactive Fukushima mountain forest! The area is designated as a "difficult-to-return zone"
A fire broke out in a state-owned mountain forest near the crippled Fukushima No. 1 Nuclear Power Plant on the evening of April 29, consuming an area approximately 10 hectares in size by the following evening, according to prefectural authorities. The fire started on 448-meter-high Mount Juman in Namie, Fukushima Prefecture, prompting the prefectural government to request the dispatch of the Ground Self-Defense Force (GSDF) on a disaster relief mission on April 30. A total of eight helicopters from Fukushima, Miyagi and Gunma prefectures as well as the SDF discharged water on the site to combat the fire.